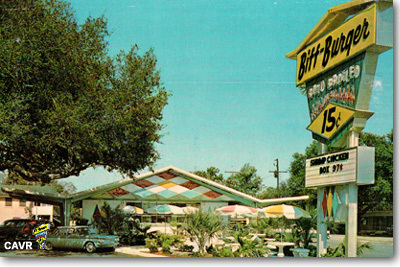 A vintage "Franchise" postcard displaying a typical Biff-Burger Drive-In restaurant. Unknown location, however the palms indicate that it is probably somewhere in Florida. The fron of the postcard displays "15 cent burgers" and "roto broiled". Back of postcard indicates how to get a biff-burger franchise and card No. 3DK-1701. 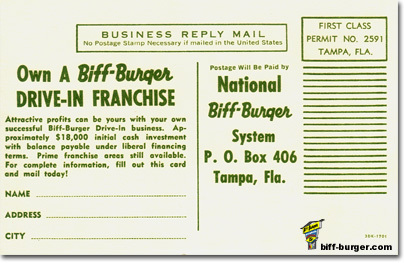 This post card was also given out along with the biff-burger franchise informational booklet (see Franchise Information). Unknown age of card. Circa 1960's. This postcard is commonly referred to as the "Franchise" type postcard due its franchise information on its back and its distribution with NBBS Investment Opportunity brochures. Note the lighted star ball on the roof of the restaurant. These were also commonly placed on top of the Biff-Burger road sign, like the one displayed at the only existing Biff-Burger location in St. Petersburg, FL. ** Source: A special thank you is given to Eric Bowyer, of Sarasota, FL, for donating the postcard (pictured above) which accompanied the "National Biff-Burger Systems, Inc. Investment Opportunity" Booklet (see below). An acknowledgement of appreciation is also given to the late great Billy Sullivan Jr. (1910-1994), Famous Chicago White Sox Baseball Player from 1931-1933, the original owner of this postcard and franchise booklet prior to its donation to the Biff-Burger Drive-In Museum, a private collection. Another vintage "Franchise" postcard displaying a former Biff-Burger Drive-In, located at 248 SW Avenue E., Corner with SW 3rd Street, Belle Glade, Florida. 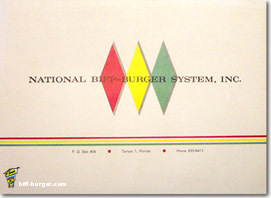 Back of postcard indicates drive-in franchise information and address for the National Biff-Burger Systems, Inc. Unknown location. Unknown age of card. Circa 1960's. Another vintage postcard displaying a former Biff-Burger Drive-In, located at 2208 S. Dale Mabry Hwy, Corner with W. Clearview Ave., Tampa, Florida. The red and white checkered water tower in the background is adjacent to the Plant High School, Tampa, FL. 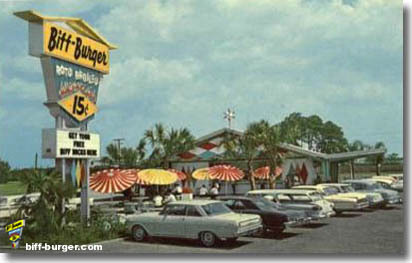 The front of the postcard displays "19-cent broiled burgers" and "thick shakes". 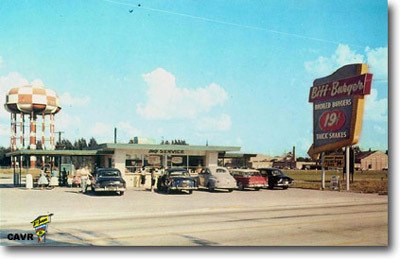 Back of postcard states, "Biff-Burger Drive-Inn, One of the many Biff-Burger Self Service Drive Inns located thorughout the Nation pledged to give you the highest quality food and service possible. Specializing in Broiled Burgers, Thick Milk Shakes and Golden Brown French Fries at reasonable prices." 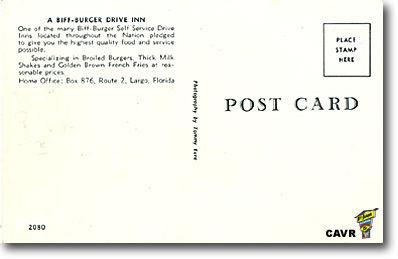 The back also has the home address of Box 876, Route 2, Largo, Florida, indicates that the picture on the front of the postcard is by Tommy Eure, and card No. 2080. Unknown age of card. Circa 1957, based on the 19-cent price. This postcard portrays the early box style structure, with double canopies on either side of the building, compaired to the later and more familiar "Port-A-Unit prefabricated structure pictured in the fore mentioned "Franchise" type postcard. This postcard also has the earlier "Downward Arrow" type roadsign. Note the price of a hamburger is "19-cents", as indicated on the road sign. This is a good indicator of age as it is known that the price of biffburgers were 19-cents when Biff-Burger was first opened in the late 1950's. With further competition with other fast food burger drive-in chains, Biff-Burger lowered its price of a biffburger to 15 cents. 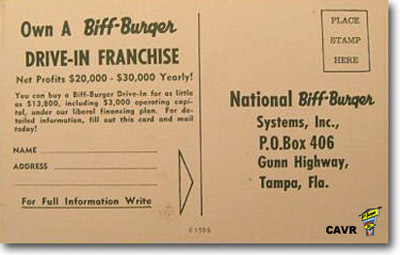 Another interesting feature of this postcard is that the contact information for the home office (National Biff-Burger Systems, Inc.) is Largo, Florida, where as the "Franchise" type postcard indicates Tampa, Florida. This vintage postcard displays the former Biff-Burger Drive-in located at 928 Volusia Avenue in Daytona Beach, Florida. Corner of Volusia Avenue, later renamed to West International Speedway Boulevard, and N. Keech Street. The front of the postcard displays the classic "Port-A-Unit" building located at the Daytona Beach Biff-Burger. The road sign indicates "15 cent" burgers and the marquee states "Shrimp Chicken Box 97 cents". 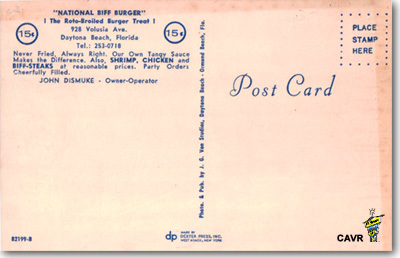 The back of the postcard states, "National Biff-Burger", "The Roto-Broiled Burger Treat", "928 Volusia Ave., Daytona Beach, Florida, Tel. : 253-0718". In additon, the card states, "Never Fried, Always Right. Our Own Tangy Sauce Makes the Difference. Also, SHRIMP, CHICKEN and Biff-Steaks at reasonable prices. Party Orders Cheerfully Filled. ", "John Dismuke - Owner-Operator". The back also states, "Photo. & Pub. by J.G. Von Studios, Daytona Beach -Ormond Beach, Fla.", and the card No. 82199-B. The card was made by Dexter Press, Incorporated of West Nyack New York. The age of card is circa 1960's, based on the 15-cent price and style of cars in photograph. Wax covered paper drinking cups made by Dixie Cup. 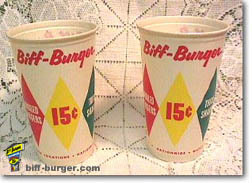 Printed on the cups are the classic colored Biff-Burger insignia diamonds used on the interior restaurant walls and the words, "Thick Shakes", "Broiled Burgers", "15 Cent Burgers", and "Nationwide Locations". The first design of drinking cup, pictured on the left, portrays the hefty "BIFF" man carring a drink and a burger, which is still used today, but modified a little, by Beef Burger in Greensboro, NC. (see notes). The second design, pictured on the right, portrays the earlier "Downward Arrow" style of the Biff-Burger Drive-In road sign. Both the first design and the second design of drinking cups are believed to be of the same age and were most likely used during the same time period of late 1950's to early 1960's. These cups are a different design than the cups shown at the top of the page as these do not have the earlier road sign or "Biff" man printed on them. 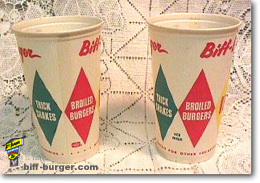 This third design of cups however still utilize the following text printed on them: "Thick Shakes", "Broiled Burgers", "15 Cent Burgers", and "Nationwide Locations". These cups also use the classic colored diamonds, which are the Biff-Burger insignia used on the interior restaurant walls, on uniforms, and other items. It is believed based on the 15 cent price that these cups were the second generation of drinking cups that were available to franchisee owners around the time the "Port-A-Unit" became available, approximatley 1962, and were used for many years. Here are additional images of the wax covered 20 Fl. oz. 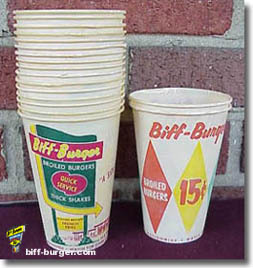 paper cups, portraying the third design, manufactured by the Dixie Cup Corporation, and used by Biff-Burger Drive-Ins for their "thick shakes". "20 Fl. Oz. Prac. Cap No. 320 by Dixie Cup Div. 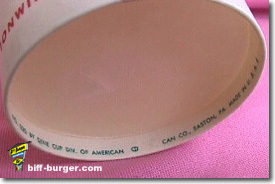 of American Can Co., Easton, Pa. Made in U.S.A.E." ** Since all three designs of printed cups have the same price for a hamburger, at "15 Cent Burgers", it is difficult to ascertain the order of introduction, duration of years used, and/or which cup design was more common than the other. 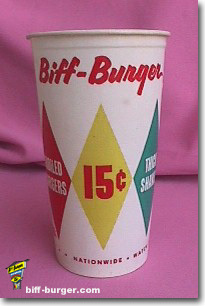 However, based solely on the "Downward Arrow" road sign and the 15 cent price, it is believed that the first two designs were introduced at the same time a few years after Biff-Burger was created, as the orignial price of a hamburger was 19 cents and later lowered to 15 cents due to competition. 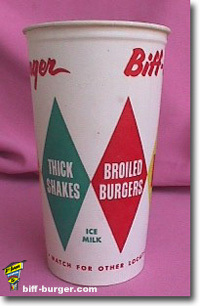 Due to the two common types of Drive-In road signs used by the National Biff-Burger System (NBBS), it is reasonably assumed that the third design, or second generation of printed cups would be more common and have a longer duration of use, since it only portrays the three colored vertical diamonds with text (more generic) instead of the "Downward Arrow" road sign design of cup which is believed to have been released earlier. Here are two images, one is inverted of the other, of a matchbook cover for Biff-Burger, portraying the "Diamond" type tri-colored road sign on the front cover and "Biffy" the Clown on the back cover. Unknown age. The spine of the matchbook cover states, "Broiled ... NOT Fried!!". The back cover states, "Biffy-the-Clown says, Visit the home of tase-temptin' tummy pleasing... Biff-Burgers and delicious thick shakes" and "100% Pure Western Beef; Broiled exclusively the Roto-Broiled way; Dipped in Tangy Bar-B-Q Sauce; Cooked to order... Served in a wink; On Delicious Toasted Roll". 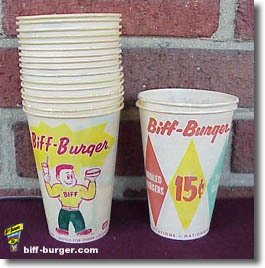 This vintage item is a great example of Biff-Burger's second mascot, "Biffy-the-Clown", which doesn't seem to have been promoted as much as the common hefty "Biff Man" mascot portrayed on the older drinking cups. Biffy-the-clown, as whimsical as he may be, has also been used in newspaper advertisments for grand opening announcements for new Biff-Burger locations. Biffy-the-Clown, created by and dressed up in costume by Mike Harris, then acting Advertising Director in 1969, generally appeared at grand openings with his circus wagon entertaining the kids. Here are two images, one is inverted of the other, of a matchbook cover for Biff-Burger. This particular matchbook cover is of great interest, mainly because of the odd type of building shown. 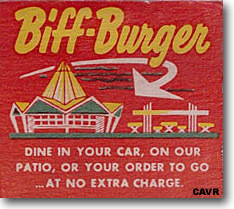 To date, this matchbook cover is the ONLY Biff-Burger item found that exhibits this particular type of building. The building design resembles "Googie Architecture" and is similiar to other burger chains at the time. In addition, the matchbook portrays the earlier "Downward Arrow" type road sign. Unknown age, but is believed to be circa late 1950's to pre-1962. 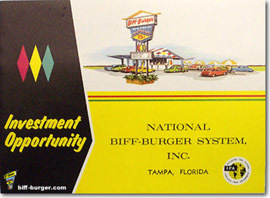 The most interesting item acquired by the Biff-Burger Drive-In Museum, a private collection, is this 14 page vintage mint condition franchise booklet titled, "Investment Opportunity, National Biff-Burger System, Inc. Tampa, Florida" (see Franchise Information). 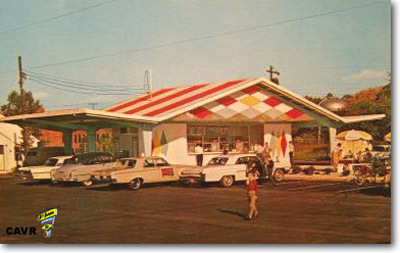 The booklet's front cover portrays, the "classic" typical Biff-Burger Drive-In location with the 3 colored insignia diamonds, Port-A-Unit structure with walk-up counter and "W" shaped roof (upswept canopy roofs), outside seating area with concrete tables and colorful umbrellas, and "Diamond" type road sign. The back cover of the booklet, portrays the chain identifing tri-colored "diamonds" as well as the former headquarters address and phone number for the National Biff-Burger System (NBBS). Circa 1962. Of particular interest within the franchise booklet, are images of the general layout plan of the prefabricated modular unit, roto-broiler, and an accompaning "franchise" type postcard (see above). ** Source: A special thank you is given to Eric Bowyer, of Sarasota, FL, for donating the franchise booklet (pictured above) which accompanied a postcard. An acknowledgement of appreciation is also given to the late great Billy Sullivan Jr. (1910-1994), Famous Chicago White Sox Baseball Player from 1931-1933, the original owner of this franchise booklet and postcard prior to being donated to the Biff-Burger Drive-In Museum, a private collection. 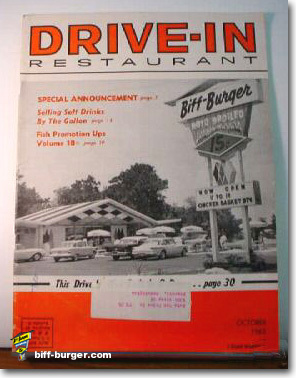 Throughout the 1960s, many Biff-Burger Drive-In articles appared in several issues of various restaurant type magazines, such as, Drive-In Management , Drive-In Restaurant, and Drive-In and Carry Out, aimed toward drive-in management, food suppliers, and potential franchise buyers. The image above is of the October 1963 cover of Drive-In Restaurant, published by Clissold of Chicago, Il. This cover portrays, as seen many times before on various items, the "classic" design and architectural detail of the "Port-A-Unit prefabricated structure and road sign that was available to franchisees throughout much of Biff-Burger's existence. Printed in red text on the front side of the vinyl plastic white holding sleeve, "Compliments of your Biff-Burger Drive-In". Rear side has no text. Unknown age. 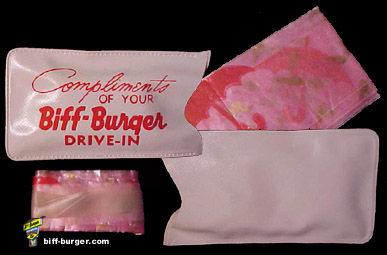 Above, are images of a plastic bonnet handed out as compliments to customers and as free gifts during a "Special Grand Opening" of a new Biff-Burger Drive-In location. 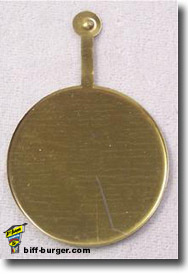 Vintage lithographed badge, 2-inches in diameter, made of metal, probably tin or aluminum. 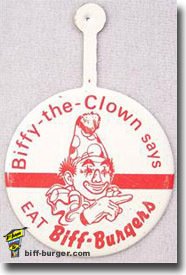 The badge portrays "Biffy"-the-Clown and was generally given out as promotional material to the kiddies along with balloons, usually at restaurant "grand openings". This vintage item is another great example of Biff-Burger's second mascot, "Biffy-the-Clown", which doesn't seem to have been promoted as much as the common hefty "Biff Man" mascot portrayed on older drinking cups. Biffy-the-clown, as whimsical as he may be, has been used in various promotional materials, such as newspaper advertisments for grand opening announcements of new Biff-Burger locations. Biffy-the-Clown, created by and dressed up in costume by Mike Harris, then acting Advertising Director in 1969, generally appeared at grand openings with his circus wagon entertaining the kids. 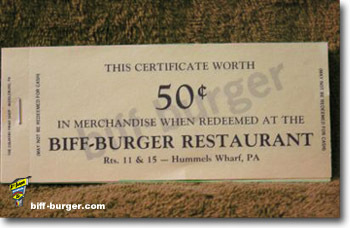 Biff-Bucks, circa 1964, used during a promotion in which customers could collect and use for future purchases of Biff-Burger menu items. 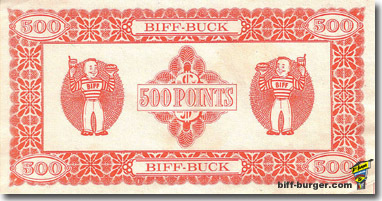 The paper Biff-Bucks displayed above represent the green colored "100 points" version and the red colored "500 points" version. 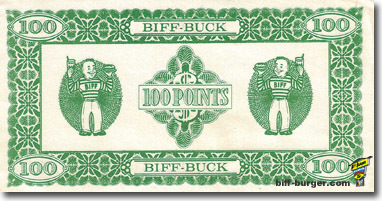 The front and reverse of each buck displayed the same image, showing the point value and the classic "Biff-Boy" logo. These Biff-Bucks, submitted by John Fuller, Alexandria, VA, were obtained and used by the Biff-Burger Drive-In, formerly located at 1040 W. Pensacola Street in Tallahassee, Fla. during the early to mid 1960's. 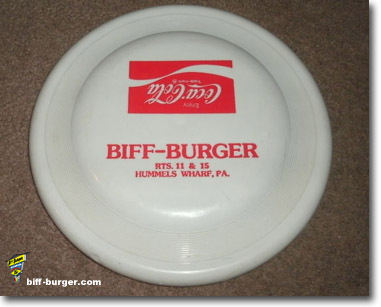 White colored frisbee made by Wham-O given out as advertising promotional pieces promoting the Biff-Burger, located in Hummels Wharf, PA. The item, believed to be circa 1975, has the text, "Biff-Burger, Routes 11 & 15, Hummels Wharf, PA" and the traditonal Coca Cola "wave" logo printed in red. Another interesting item acquired by the Biff-Burger Drive-In Museum, a private collection, is this vintage un-used ash tray molded of black plastic and believed to be of the same type used in the Biff-Burger restaurants. Unknown age. 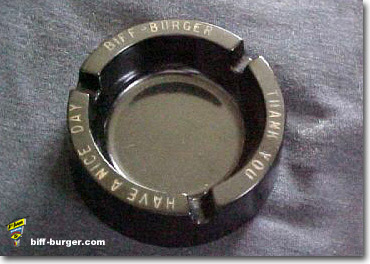 Printed in gold around the top rim of the ash try, it reads, "Biff-Burger", "Have a Nice Day", and "Thank You". Printed on the bottom of the ash tray, The GEM, No. 850, Heat Resisting Plastics, Made in U.S.A., and Harry Davies Molding Co., Chicago, ILL."
Packet of 10 "unused" gift certficates, worth 50 cents each, for merchandise at the Biff-Burger location in Hummels Wharf, Pennsylvania. Unknown Age. It is believed that the age of the certficates are definitely post-1974, considering the font type for the words "biff-burger" in the background mimic the lower-case version used for the roadsign (as seen at the very top of the page), which was replaced due to being struck by lightning in 1974. The certificates are believed to be circa 1990s due to its monetary value for each certifcate. The text along both sides of the certificate state, "May Not Be Redeemed For Cash". ** Full credit is given to the appropriate individuals and/or respective sources from which many of the images above have been extracted from, including but not limited to, online auctions and others, for historical archival purposes (see "Purpose" and "Copyright Notice" under the Disclaimer).